"You are capable of anything." Cohen Media Group has debuted the official US trailer for the indie Girls of the Sun, which premiered at the Cannes Film Festival last year in-competition. The film is inspired by and loosely based on the story of the late journalist Marie Colvin (who already had a film made about her - A Private War). 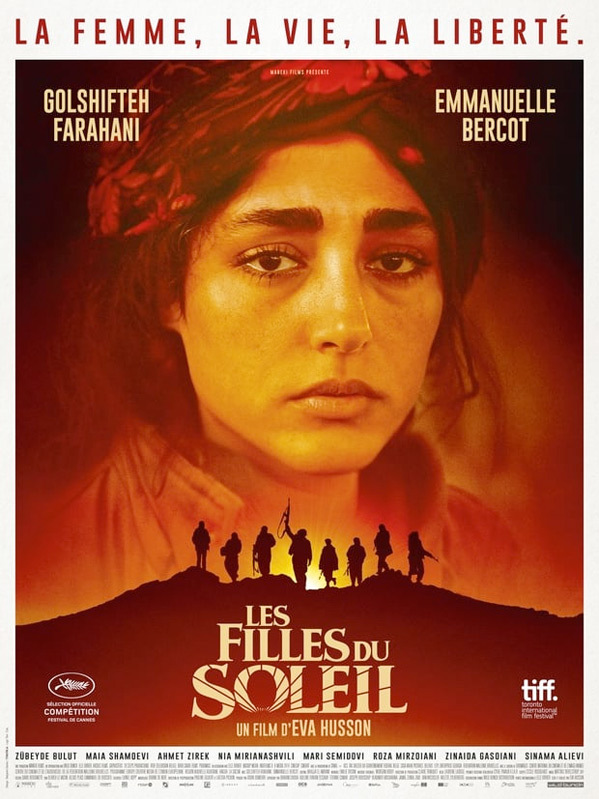 In Girls of the Sun, a French war journalist named Mathilde H. (basically Marie) meets an all-female squadron of rebel fighters known as the "Girls of the Sun", lead by their fierce leader Bahar, played by the always-exceptional Golshifteh Farahani. They plan a counter-attack in order to regain control over their nearly-destroyed city. Co-starring Emmanuelle Bercot as Mathilde, with Zübeyde Bulut, Sinama Alievi, Mari Semidovi, Roza Mirzoiani, Zinaida Gasoiani, Maia Shamoevi, Nia Mirianashvili, and Evin Ahmad. This is an intense, gripping thriller that once again shows just how horrible war really is. Somewhere in Kurdistan, Bahar (Farahani), commander of the "Girls of the Sun" battalion, is preparing to liberate her hometown from the hands of extremists, hoping to find her son who is held hostage. A French journalist, Mathilde (Bercot), comes to cover the attack and bear witness to the story of these exceptional warriors. Since their lives have been turned upside down, the Girls of the Sun find themselves fighting for women, life and liberty. Girls of the Sun is directed by French filmmaker / writer Eva Husson, director of the films Those for Whom It's Always Complicated and Bang Gang previously. The screenplay is also written by Eva Husson, in collaboration with Jacques Akchoti. This first premiered at the Cannes Film Festival last year (read our review), and also played at the Toronto, London, and Stockholm Film Festivals. Cohen Media Group will release Husson's Girls of the Sun in select theaters starting April 12th this spring.